We love fly fishing with dryflies. Over the course of a Montana fly fishing season our Bozeman, Montana fly fishing guides employ a variety of tactics to help anglers catch trout, but nothing beats a fish coming up to eat a well presented fly floating on the surface. There is something special about that moment and is what keeps many of our anglers coming back year after year to fish all of our great rivers. We see the same cycle of hatches on our rivers year after year. We are lucky in Bozeman, MT to be able to have great dry fly fishing opportunities from April through October. From mayflies, to caddisflies, to stoneflies, to terrestrials, we’ve truly got it all. Each hatch has its own unique character and while we love them all, here is a rundown of our top 10 hatches to fly fish in Bozeman, MT. The granddaddy of them all. The Yellowstone River salmonfly hatch is the biggest and baddest hatch in all of Montana. Those are probably fighting words to many across the state, but I’d be willing to put this hatch up against any other. First off the bugs are huge. Imagine looking up and seeing 10,000 flies that look like small hummingbirds flying around. Second the fish that eat them are even bigger. The biggest of the brown trout, rainbow trout, and cutthroat trout that inhabit the Yellowstone River come to the surface to eat Salmonflies. Best time of year to catch a true trophy on a dryfly. Lastly, the Yellowstone River has the longest Salmonfly hatch in the state, and probably the world. The bugs will start to hatch just below Livingston in late June and make their way upstream all the way to the LeHardy Rapids. Sometimes into early August. A dedicated salmonfly angler could spend a whole month chasing big bugs on this river alone. Best hatch in the west? We think so. The PMD (Pale Morning Dun) Mayfly hatch on the Missouri River is the reason many of our guides are booked a year out for mid-June. The fishing is that good. From June 10th thru early July, anglers can expect great hatches of PMDs daily, bringing some of the biggest fish in the river up to eat them. 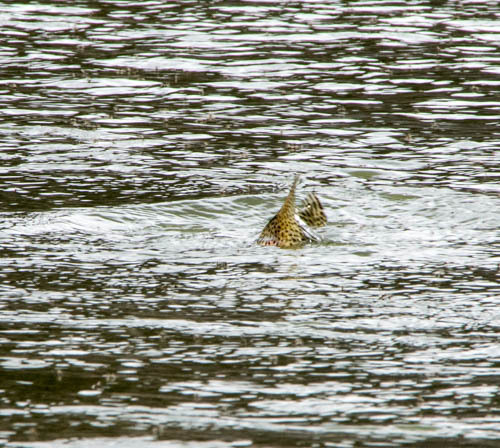 There is something about these big mayflies that big brown trout especially seem to love. Early in the hatch less than perfect presentation and big flies can get it done, but the fish get smarter as the hatch progresses. Cripples and spinners quickly become the flies of choice and a good first cast becomes mandatory. Our Montana fly fishing guides are all great teachers that work with anglers to perfect their dryfly game, and consistently lead anglers to success during this world-class hatch. But be sure to book your dates early. It is a favorite for a reason. Hopper fishing on the Yellowstone River is classic Montana freestone dryfly fishing at its finest. Pick your favorite pattern and color, dead drift it, twitch it, strip it, drown it, or drag it, and fish will eat it. The Hopper hatch is less a hatch and more of a season. Expect things to start in middle-late July, peak in late August, and continue on through early October. Some days are better than others but you can always count on a few fish ready to crush a hopper pattern during hopper season. Probably the best hatch for beginner and intermediate anglers to take part in and great for expert anglers to have fun with. We like warm and windy days for the best action, but any day can be your best day ever yet. And big fish are always just a cast away with a hopper on the Yellowstone River. The evening Caddis hatch on the Yellowstone River holds a special place in our hearts. Some of my best memories of fly fishing on the Yellowstone River with family and friends take place during this hatch. Hard to beat hot summer nights with great people and great fishing. This hatch generally starts in late June and is a nightly occurrence through the end of July. No reason to be on the water before 6PM if you are hoping to catch it. At its best it is a blizzard of caddisflies and trout boiling along the banks chasing after. Some nights are more mellow, but it is hard to beat a Montana sunset on the Yellowstone River all the same. If hunting for trophy trout with large dryflies sounds like fun, the salmonfly hatch on the Madison River is the hatch for you. The biggest and baddest of the trout in the Madison River love to hammer Salmonflies. But they don’t come every cast. Anglers can expect to fish hard but be rewarded with some truly great trout. The hatch on the Madison River generally starts around June 20th and moves upriver with salmonflies at Lyon’s Bridge on the 4th of July. But sometimes it comes and goes much quicker. This hatch is a hard one to time and no secret in fly fishing circles, but anglers that hit it right are rewarded with some of the best fly fishing every year in Bozeman, Montana. I hear a lot of random factoids while guiding anglers. One was that ants have a certain kind of protein in them that fish need and can only get from eating ants. While I haven’t done any further research into this claim, I do know that the trout in the Madison River absolutely love to eat flying ants. The flying ant or “honey ant” hatch on the Madison River is some of the most fun dryfly fishing of the summer. The bugs hatch from top to bottom on the Madison River and are especially thick around Three Dollar Bridge, making for great wade fishing dry fly opportunities. This is a late summer hatch that usually start in late July and peaks in mid-August. No reason to be on the river early to catch it. The ants will start to fly around mid-day but won’t get going in earnest until the sun starts to dip down into the sky. These ants are a distinct golden-cinnamon color and can get quite large. #12 and #14 flies are a great starting spot. Fish them tight to the banks, out in the middle, or in the slicks behind rocks really wherever fish are holding. Big trout like flying ants. They need that protein. If you consider yourself to be a masochistic angler this is the hatch for you. Tiny flies, selective trout, light tippet, and tough lies are what this hatch is all about. The trico hatch gets going in late-July and continues through mid-August. This hatch looks like smoke on the water. By sunrise the bugs are out in huge mating clouds. The spinners begin to fall on the water mid-morning and the many trout of the Missouri River gorge on them by the mouthful. This is a dead-fly hatch, meaning the bugs don’t move at all. Perfect casts and dead drift get rewarded. Dragged flies get laughed at. Our fly fishing guides love this hatch and teaching anglers the finer points of technical dryfly fishing. The fly fishing 20/20 club is exclusive to anglers who have caught a trout 20 inches or better and flies size 20 or smaller. And the trico hatch on the Missouri River is your best bet for joining. Winters are long in Montana. Even longer for fanatic dryfly anglers. But waiting for us at the end of even the longest of winters is the early spring midge and BWO (Blue Winged Olive Mayfly) hatch on DePuy’s Spring Creek. It is like Christmas all over again but instead of snow and presents, we get thick hatches and plenty of rising trout. This hatch is the first of the season for us in Bozeman, MT and the first sign that fishing season is here. It makes me smile thinking about it now: digging out the fly rods, dusting off the waders, tying on my favorite midge cluster, and heading to the creek. Anglers can expect the bugs to start hatching as soon as winter breaks, generally in mid-late March. The midges come first and the BWOs begin to hatch in early April. This is classic spring creek sight fishing at its best: just you, the fish, the bugs, the cold spring air, and not a worry in the world. If the river is too high, it doesn’t happen. If the weather is too cold, it doesn’t happen. This hatch is a sensitive one, but when it does go off, it goes off with a bang. When I think of the Mothers Day caddis hatch on the Missouri River I think of smokestacks of tan caddis flying on the river’s edge and a blanket of caddis dancing across the Mighty ‘Mo. The fish will eat tens at a time along the scum lines. Get yours in line and hold on for the ride. Truly a hatch you have to see to believe. The town of Craig, MT holds the Craig Caddis Festival every year to get the never-ending summer party started when the bugs start to hatch. One heck of a present for Mom. The BWO (Blue Winged Olive Mayfly) hatch on the Yellowstone River is a favorite hatch of many of our anglers and Bozeman, MT fly fishing guides. While this hatch isn’t the thickest, the bugs aren’t the biggest, and usually the fish rising to them are generally average size, it happens at a perfect time that coincides with solitude on the river. The BWOs hatch on the Yellowstone in April and again in October. If you have check out our Montana Fly Fishing Calendar you already know we love fly fishing in Montana this time of year. The rivers are quiet, days are cool, fish are happy, and anglers can find real solitude on the Yellowstone River. And the BWOs are hatching. These small, green mayflies vary in size from #16-#24 and bring plenty of fish to the surface to eat them. The hatch generally starts mid morning, peaks mid-day, and tapers off by late afternoon. No reason to get to the river early. While we do blind fish during this hatch, this can be some of the best sight fishing of the year to steadily rising trout on the Yellowstone River. And you will have the whole place to yourself.